The reopening of a landmark East Jerusalem cinema could provide local Palestinians with a much-needed dose of ‘reel’ freedom. In East Jerusalem, the occupation has affected the city’s cultural landscape. Chronic underinvestment, expanding settlements and a massive wall – which Israel says it has constructed for security purposes and Palestinians allege is a land grab – have had the effect of squeezing the life out of the Palestinian quarter in Jerusalem and shifting the cultural centre of gravity to Ramallah in the West Bank. In addition, it seems many Palestinian Jerusalemites have not been able to shake off the curfew mentality of the intifada, which ended almost seven years ago. In the past few years, however, efforts have been launched to revive and enrich East Jerusalem’s modest cultural topography. The latest of these is the reincarnation of the old al-Quds cinema, which closed down a quarter of a century ago during the first intifada (which lasted from 1987-1993). Now it is the state of the art, though still unfinished, Yabous Cultural Centre. 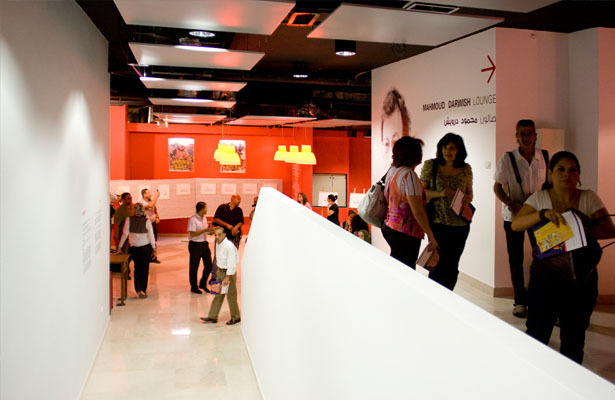 In addition to film screenings, it hosts artistic, theatrical and musical events, including a photo exhibition about the Egyptian revolution and live jazz concerts. Yabous marked its reopening with Freedom Films Week. The theme is appropriate given the thirst for political, economic and social liberty, evident not only amongst Palestinians but peoples across the region – including in Israel, where a broad-based social protest movement erupted last summer. Israeli protesters declared Rothschild Avenue in Tel Aviv their own “Tahrir Square” and Arab commentators dubbed the movement the “Israeli Spring”. The films featured at Yabous included We Won’t Leave, which chronicles the Palestinian struggle against forced displacement in Jerusalem; Fallega, which documents the innovative and inspirational sit-ins organised by Tunisian activists following the fall of dictator Zine el-Abidine Ben Ali; and Cairo 678, a taboo-breaking drama about sexual harassment in Egypt. Rima Essa, Yabous’s cinema coordinator and the festival’s curator, says that Palestinian Jerusalemites have been in a “coma when it comes to cinema”. She sees the festival and the Yabous Cultural Centre as “a bridge to restoring the long-interrupted relationship between the Palestinian audience in Jerusalem and cinema theatres”. But can ‘reel’ freedom help Palestinians achieve real freedom? “The role of culture is crucial,” says Essa, “our people crave it.” She believes that cinema can help connect a new generation of young Palestinian Jerusalemites to the broader Arab and global context, enabling them to relate their situation and struggle to the outside world and end their years of isolation. And numerous Palestinian films and directors have, in recent years, managed to raise awareness of their statelessness and their quest for nationhood, leading to international acclaim. One notable example is the Palestinian-Israeli film director Elia Suleiman, whose 2002 surreal black comedy Divine Intervention about a love affair across checkpoints between two Palestinians, one living in Israel and the other in the West Bank, became an international hit. His first feature film, Chronicles of a Disappearance, (1996) received widespread critical acclaim. However, Essa, who is a film director and the first Palestinian to graduate from Israel’s foremost film school, Sam Spiegel, does not believe that cinema can build bridges between Palestinians and Israelis because of the stark inequality between the two sides. “I am in favour of a complete cultural boycott of Israel,” she opines, though she admits that she would not stop Israeli Jews who come to the cinema of their own accord. Essa, who dreams of a single democratic state for Jews and Arabs, is convinced that engagement between the two sides in the current status quo “would not constitute a discourse of peace… because there is no balance or equality”. In addition, she believes that dialogue not only leads nowhere but provides Israel with a political smokescreen behind which it can continue to push ahead with its settlement enterprise. “You can go to as many debates as you like about water or land, but the occupation carries on unchanged,” she says. But other filmmakers recognise the power of collaborative art to build bridges. For instance, Palestinian Emad Burnat and Israeli Guy Davidi were co-directors of Five Broken Cameras, a film which documents the nonviolent struggle of the residents of the Palestinian village Bil’in – who are armed only with cameras – to stop the seizure of their land. 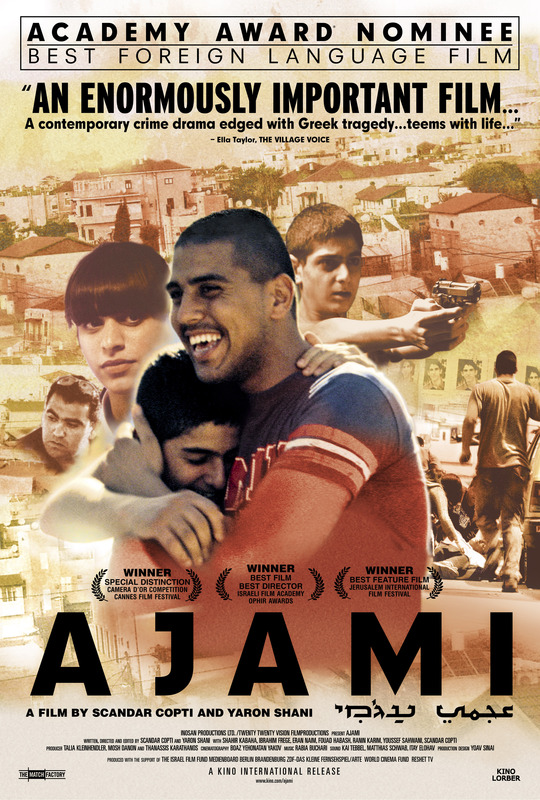 One landmark co-production is the crime drama Ajami, directed by first-time filmmakers Scandar Copti and Yaron Shani, which realistically depicts life in the deprived Jaffa neighbourhood of the same name. 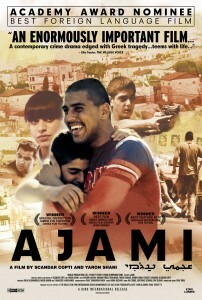 The film not only manages to challenge Israeli stereotypes about the neighbourhood Ajami and delve into the complexity of human relationships between Muslims, Christians and Jews in Israel, it also won Israel’s top film accolade, the Ophir Award, and was nominated for an Academy Award in the United States. But the strength of film does not stop at its power to alter people’s ways of thinking and challenge their conscience. Cinema theatres themselves help create a sense of community. For instance, my Palestinian neighbour, who is almost 90 years old, recalls a time before partition and war when her Jewish neighbours were “friends” and often sat side-by-side at the cinema, with the ethereal Egyptian Jewish actress Leila Murad a particular inter-communal favourite. In today’s bitterly divided and segregated context, this image may appear like a far-fetched cinematic fantasy, but it once held true – and may again. 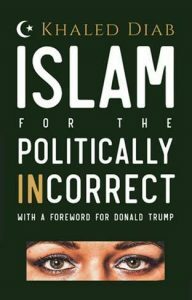 This is an extended version of an article which was published by the Common Ground News Service on 6 March 2012.